To Cite: Rashidi Maybodi F, Owlia F, Akhavan Karbassi M, Navab Azam A. Importance of Considering Rare Disorder as Eosinophilic Granuloma in Differential Diagnosis of the Common Oral Disease, Int J Cancer Manag. 2016 ; 9(5):e5684. doi: 10.17795/ijcp-5684. Introduction: Eosinophilic Granuloma (EG) is one of the subsets of langerhans cell histiocytosis Oral presentation may comprise multiple alveolar lesions accompanied by bleeding, gingival inflammation and teeth mobility ,which may encourage patients to seek a dentist. Case Presentation: In this report, a case of an 18 year old male patient with multifocal lesions of EG in both jaws is presented. Conclusions: Although LCH remains an enigma for clinicians to date because of its ambiguous presentations, but timelydiagnosis could be critical for prognosis. And dentists could have an important role in diagnosis of rare disorders like EG. 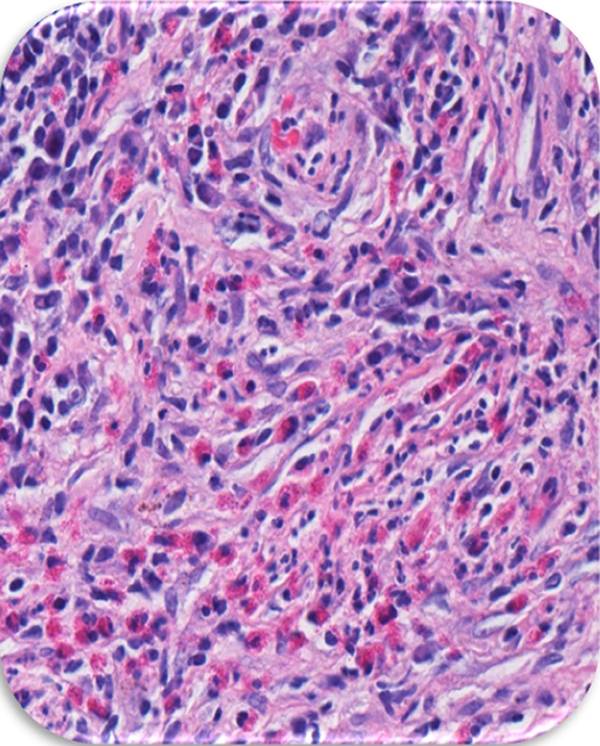 LCH, previously termed Histiocytosis X, is a rare disease characterized by the abnormal proliferation of the bone marrow-derived histiocytes (1, 2). It can present both local and systemic manifestations involving bone, skin, mucosal tissue and internal organs (2). LCH includes three subtypes: EG, Hand-Schuller-Christian disease and Letterer-Siwe disease (3). EG is the most benign disorder of this triad and it involves localized lesions predominantly of the long bones (3, 4). It accounts for 60% - 70% of all cases of LCH and can be seen as solitary or multifocal lesions (1, 4). Multifocal lesions have a more severe and even fatal course (5). LCH is slightly more prevalent in young males and commonly involves mandible more than maxilla, when the jaws are affected (5, 6). In this report an 18 year old male patient with oral complications as the first sign of EG is presented. An 18 years-old male with complaint of proceeding tooth mobility in both jaws with occasional pus-like discharge, gingival bleeding and pain sensation during mastication, referred to the Yazd periodontology department. Familial history was unremarkable. In his medical history he had an uneventful weight loss during last year (about 10 kg). Clinical examination for lymphadenopathy had a positive outcome in submandibular nodes. In first intraoral examination, extensive destruction was seen in dento-alveolar region with deep atypical ulcerative area characterized by induration, irregular borders in anterior and left sides of mandible as well as left side of maxilla (Figure 1). There was a remarked gingival recession on the buccal aspect of mandible. Second premolar and the first molar in left mandible and left maxillary first and second molars had been extracted because of excessive mobility. A, first oral examination; B, after two months; C, exophytic mass on the anterior part of the mandible; D, destructive area on the posterior side of the mandible; E, destructive area on the buccal aspect of the mandible. 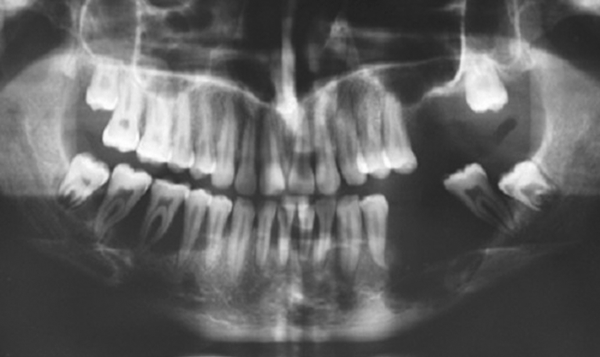 Panoramic view showed some distinctive ill-defined osteolytic lesions in both sides of mandible and left side of maxilla (Figure 2). 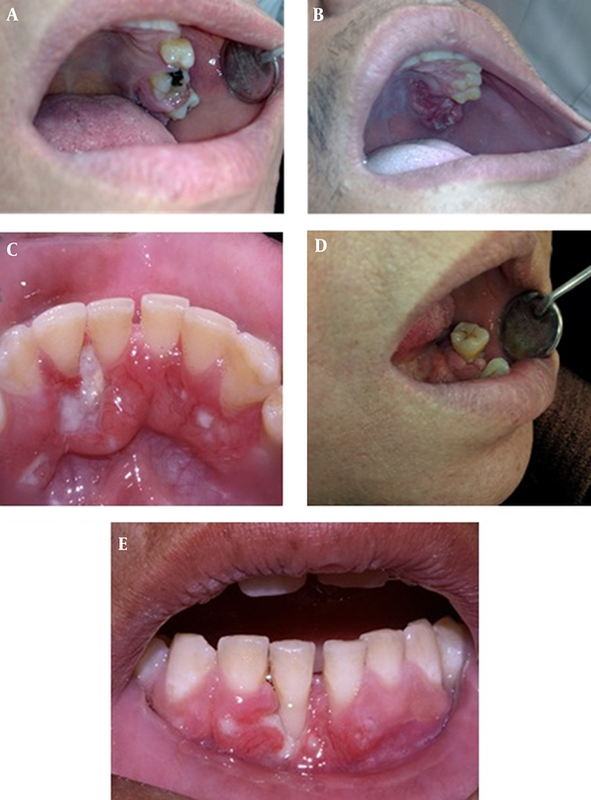 Lesions in both sides of mandible had produced a “floating on air” appearance in the region. Osteolytic lesion was extended to vacinity of the lower border of the mandible in the left side. There was also a noteworthy point in general examination. The patient reported a limitation in range of motion in left upper arm and also pain during upward movement. To determine a diagnosis, an incisional biopsy was conducted. In histologic view, proliferation of eosinophils round cells with coffee bean-shaped nuclei which is characteristic for Langerhans cells (Figure 3). 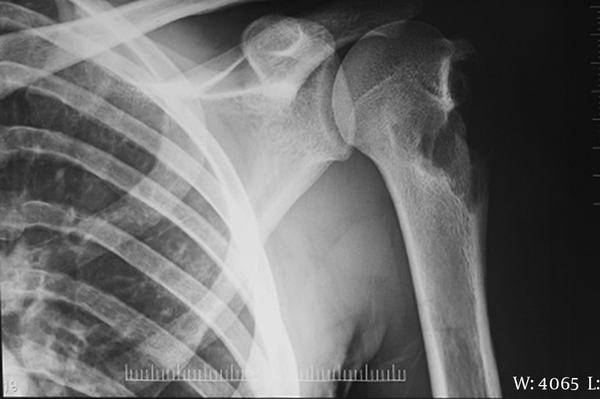 Radiographic view of left upper arm also showed an osteolytic bone lesion (Figure 4). As multiple bone areas were involved, surgery or curettage was not the first treatment choice. The patient was referred to the hematologist for further treatment. After two months, the patient was again examined by our periodontist and there was no significant change in oral condition except a new ulcerative lesion in palatal of left maxilla (Figure 1B). Written informed consent was obtained from the patient for the publication of this case report and accompanying images. LCH is a rare disorder and even rarer with jaw involvement, usually involves children and young adults (1). It is inclined to occur in bones more than other organs like liver, skin, bone marrow, lymph nodes and lung. Jaw involvement usually happens in 10% - 20% of bone involvement with tendency to mandible (1, 6). Common oral presentations of LCH are periodontal involvement and teeth loosening (7). A list of probable diagnosis for multifocal destructive lesions includes osteomyelitis, Ewing sarcoma, osteosarcoma, Giant cell granuloma (or Brown tumor), multiple odontogenic keratotic cyst, multi-lacunar cyst, leukemia and lymphoma (2). All of these cases can lead to advanced periodontitis in affected area. According to low age and no evidence of hyperparathyroidism, Brown tumor was ruled out. Leukemia usually occurs with prodromal signs like fever and myalgia (8). In spite of its acute process, Lymphoma, in jaw especially non-Hodgkin type, usually presents as an exophytic mass in socket of extracted teeth (8). A generalized form is one of the differential diagnoses. It was noticed that osteomyelitis occurred in individuals with susceptible situations like poor controlled diabetes, immunosuppression or old age (9). None of these conditions exists in this case; therefore, it is an unlikely diagnosis. Multiple odontogenic keratocysts usually occurs in patients with basal cell nevus syndrome, but can occur independent to syndromes (9). The most likely diagnosis was LCH and after incisional biopsy from different involved areas, LCH was confirmed. Due to being a rare disease with high clinical variability, it was a failed attempt to determine definite prognosis for LCH. Although LCH has a benign nature, it has some alternating phases of relapse and remission (2). Because of multifocal lesions in jaws, in this case, surgery was not a sufficient modality of treatment; therefore, oncologist provide a CHOP chemotherapy for him in multiple sessions and follow- ups were scheduled. Although LCH remains an enigma for clinicians to date because of its ambiguous presentations, but timelydiagnosis could be critical for prognosis. And dentist could have an important role in diagnosis of rare disorder like EG. Mahmood Akhavan Tafti department of pathology, Shahid Sadoughi University of Medical Sciences, Yazd, Iran. Conflict of Interest: The authors had no conflict of interest.